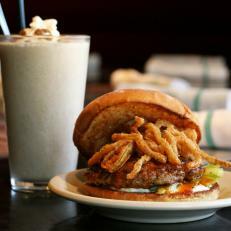 Chef Michael Kornick is making more than a dozen types of gourmet burgers. The unique and contrasting "monster flavors" of the bison burger with blueberry barbecue sauce, goat cheese and marinated onions impressed Guy. He also enjoyed the salmon burger with Thai curry mayonnaise and Asian coleslaw.